PB101 Features: -Foldable for easy transport and storage. -Cute frog design. -Steel frame construction. -Polyester seats and umbrella. -Powder coated finish. -Includes 2 chairs, 1 table and 1 umbrella. Table Top Finish: -Green. Table Base Finish: -Green. Table Base Material: -Metal. 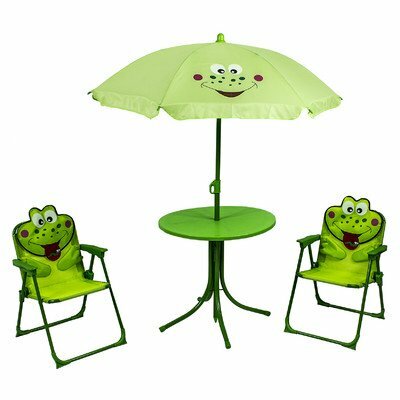 Dimensions: -Umbrella: 48" H. Table Height - Top to Bottom: -19". Table Width - Side to Side: -19.5". Table Depth - Front to Back: -19.5". Overall Product Weight: -11 lbs. If you have any questions about this product by River Cottage Gardens, contact us by completing and submitting the form below. If you are looking for a specif part number, please include it with your message.